Two US senators, on Thursday, went public with their proposal to cut short-lived climate pollutants (SLCPs) which are currently responsible for 40 per cent or more of global warming. 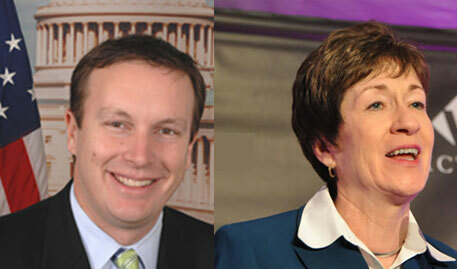 Introducing the Super Pollutants Act of 2014, senators Chris Murphy (Democrat, Connecticut) and Susan Collins (Republican, Maine) have called for establishing a task force to review specific policies and laws to reduce black carbon, methane, and high-global warming potential (GWP) hydrofluorocarbons (HFCs). Known as “super pollutants,” these pollutants stay in the atmosphere for much less time and are much more potent than carbon dioxide. While black carbon is a major element of soot from wildfires, cook stoves, and natural-gas-fueled power generators, methane is emitted in large quantities by the natural gas, petroleum, and agriculture industries and HFCs are used in air conditioning and refrigeration. “Short-lived climate pollutants are the problem too few people are talking about, but are doing some of the worst damage to the atmosphere,” Murphy said in a statement. Experts believe that cutting SLCPs is six times more effective in protecting the climate through 2050 than cuts to CO2, but both are essential for staying within the 2°C guardrail. According to US-based Institute for Governance & Sustainable Development, reducing SLCPs can lower warming by up to 0.6°C by 2050 and up to 1.5°C by the end of 2100. Aggressive cuts to CO2 can lower warming by 0.1°C by 2050, and 1.1°C by 2100. These pollutants are fast acting and can provide more than half the solution needed to stay below the 2°C guardrail through the end of the century. The proposed legislation will reinforce the administration’s international efforts to reduce SLCPs. The proposal also calls for the US Agency for International Development to prioritise black carbon mitigation activities as part of aid distribution activities and to give special emphasis to projects that produce substantial environmental damage. Furthermore, technical guidance will be provided to other countries on containment of emissions from gas drilling, landfills, coal mining, and agriculture when engaging with other governments. “The Super Pollutants Act will accelerate and coordinate administration efforts already underway to reduce SLCPs”, said Durwood Zaelke, president of the US-based Institute for Governance and Sustainable Development. “This will reinforce the President’s international leadership on this critical climate strategy. It’s essential to reduce SLCPs along with carbon dioxide to keep the climate within safe bounds,” he said. The US, along with Canada and Mexico, Micronesia, and Morocco, have made formal proposals to phase down production and consumption of HFCs under the Montreal Protocol, leaving accounting and reporting in the UN Framework Convention on Climate Change. The G7 endorsed this strategy earlier this month, as did the G20 last September. President Barack Obama and President Xi Jinping of China have negotiated two bilateral agreements on HFCs, including one last year to launch formal negotiations under the Montreal Protocol. I saw an academic study discussed and critized that position.